Idon't no how to play a saxophone,but everytime i listen to Kenny G. I wish i did. I recently discovered your online radio station, WKGRS, and love it! It's all I listen to. I not only like the Smooth Jazz you play, but the variety of music you play. One problem though is that you only play 30 minutes of music then break for commercials. What happened to the hour of music you played when I first started to listen to your station? This is what first got me hooked to your station was the wide variety of music, and an hour of commercial free music. Helllo everyone!I'm a very poor sax player,Kenny,would you be so kind to offer me on of your used alto or tenor saxophone,wich i would never may bought it,even if i would live for an century&half!Greetings from Romania,it would be very nice from the part of you to have my willing on your consideration...........Goe! I really appreciate all that you have done in music and your awesome artistry. When I watched your Youtube video on circular breathing, it reminded me of Roland Kirk, the simul-sax player and I felt like suggesting that you undertake playing two or more saxes at the same time like Roland did. I am sure that you would be a giant at this and your followers would just love it too. You must have heard of Jeff Coffin, who IMO, does a fantastic job of playing Alto & Tenor simultaneously. look him up on Youtube as well as some other multi-sax guys over there. I can just see you doing this thing to the MAX and it would be a SENSATION for all based on your superb abilities and talents. YEAH ! 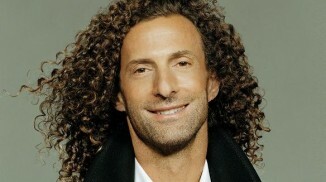 KENNY G IS HIMSELF A HUMBLE PERSON , UNIQUE SAX PLAYER , HE LOVES EXPRESSING HIS SAXOPHONE ! YET HE CARES FOR OTHERS , HIS BAND AS FOR EXAMPLE ..................KEEP THAT KENNY ! Great site and online radio station. Kenny, I am loving it! I like the little bio you provide on the artists you play. Thank you for making my sunsets, walks on the beach ,star gazing,and writing even more spectacular....... Thanks for sharing your gifting and love.